A MAG3 scan is one type of imaging test – a test that uses special equipment to create one or more pictures of part of the inside of the body. This topic gives general information. The way the MAG3 scans are performed will vary between different hospitals. The urinary system gets rid of things that the body no longer needs, so that we can grow and stay healthy. The bladder is a bag that stores urine until we are ready to urinate. It sits low down in the pelvis. What is a MAG3 scan? A chemical called mercaptoacetyltriglycine (MAG3 or MAG III) is injected into your child’s body. MAG3 is linked to a radioisotope. It emits (gives out) a type of radiation (source of energy) called gamma rays. MAG3 is taken up in the kidneys and passed out into the urine. The camera detects gamma rays emitted from the MAG3 as it is taken up in the kidneys and flows out of the kidneys in the urine to the bladder. Why does my child need this test? The MAG3 scan is used to find out how well each kidney is working (the kidney function). It also shows how well urine is leaving, or draining from, your child’s kidneys. This may help to find out whether there is a blockage that affects the flow of urine from his or her kidneys. The scan can also be used to check whether the flow of urine from the bladder goes up the wrong way in vesicoureteral reflux (VUR). This type of test is called an ‘indirect cystogram’. This can be used as an alternative to a micturating cystourethrogram (MCUG) if your child is old enough to cooperate with emptying his or her bladder when he or she is asked to. Gamma rays are one type of ionising radiation, a form of energy. At high levels, ionising radiation can be dangerous to humans because it can damage cells, the living parts of the body. We are all exposed to ionising radiation – in our homes and workplaces (it is in some construction materials and it seeps from the ground into buildings), when we eat certain foods, and when we take a flight. However, this is at very low levels. A MAG3 scan uses a small amount of radiation, and so is considered safe. The radionuclide that is injected into your child’s body becomes inactive after a few hours and is passed out of his or her body in urine or faeces (poo). However, your doctor will carefully consider the risks and benefits of doing this test in your child. Your child does not usually need to do anything to prepare for this test, but your doctor will let you know. Your doctor may ask whether your child has allergies to any medicines or contrast dye that may be used during the test. Older girls may be asked if they are having their period, and about the dates of their last period. They may also be asked if they are pregnant or if they could be pregnant. This is because ionising radiation from X rays may harm an unborn baby. Your child may be able to meet with a play specialist, who can use dolls and other toys to help him or her prepare for the test. The MAG3 scan takes place in the nuclear medicine department of your hospital. A radiographer, or a nuclear medicine technician, a specialist trained in imaging tests, performs the test. This test usually takes about half an hour, though it may be longer. You will be given more information. The radioisotope is injected into a blood vessel, using a needle or a small plastic tube called a cannula. This is usually in the hand, arm or foot. Your child may feel a sharp scratch from the needle. A local anaesthetic, a spray or cream, can be put on your child’s skin before inserting the needle or cannula, to help your child stop feeling any pain. During the scan, your child lies on a scanning bed. Your child needs to lie very still while a large camera above him or her takes pictures. 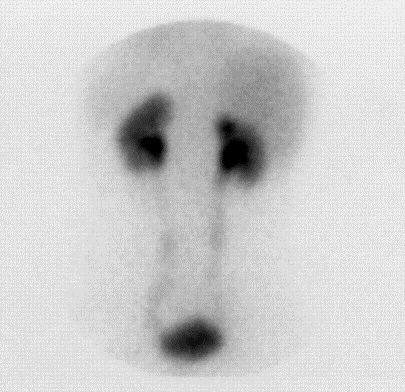 These show the radioisotope moving through his or her kidneys. Occasionally the MAG3 test is extended to include an indirect cystogram. This involves taking images of the child’s bladder as it empties, to see whether there is reflux (backward flow) of urine back up to his or her kidneys. An indirect cystogram can be done in children who can control their bladder. A direct cystogram also uses the MAG3 radioisotope to look directly for urine reflux. In the UK this is only very rarely used. The MAG3 isotope is injected into the bladder, either directly or through a catheter into the bladder, and images are taken as the child passes urine. Your child may be asked to drink lots of water after the test. This will help ‘flush out’ the radionuclide from the body more quickly. Your child can usually go home straight away. There may be a small amount of MAG3 in your child’s urine for 24 hours after the test. Your child should sit on the toilet to urinate (wee) for the day after the test. Make sure he or she washes his or her hands with water and soap. If your child uses nappies, put used nappies in a separate bag for 24 hours, then throw them away in your normal rubbish. Remember to wash your hands with water and soap. If your child accidentally wets his or her clothes or bedding, put these in a separate bag for 24 hours and then wash them as normal. Pregnant women should avoid direct contact with the child’s urine or faeces for 24 hours. The radiographer or nuclear medicine technician performing the test will send a report to your doctor. Speak with your doctor about when you should expect the results. Version 2, February 2017. © RCPCH, BAPN and BKPA 2013, all rights reserved. Reviewed by: February 2020.